Last June, he presented a motion that would require the city to flag the top two locations where violations occur each year. He said the goal is for Public Works and the police to propose measures to reduce speeding and increase safety, rather than leaving the locations unaddressed and allow it to continue generating tickets. 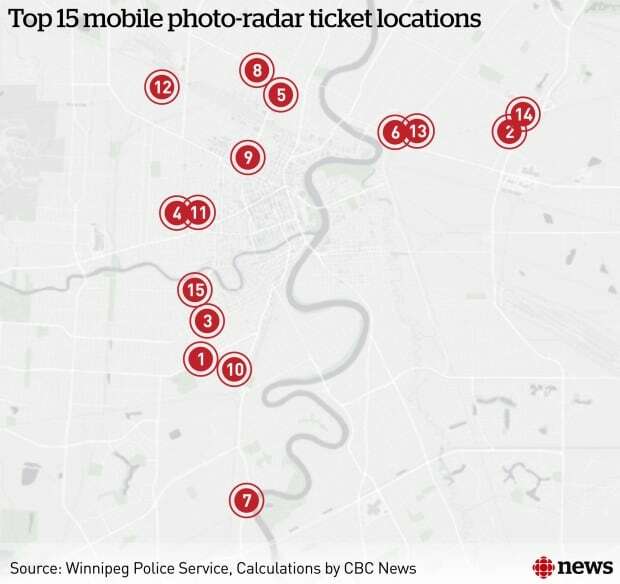 It is not safe for police to stand out in streets with vehicles whizzing by at 80 kilometres an hour, he said, adding many good candidates for mobile photo radar — regional roads such as Chief Peguis Trail, Bishop Grandin Boulevard and the southern extension of Kenaston Boulevard — either didn’t exist when mobile photo radar arrived in Winnipeg or weren’t busy enough to warrant the enforcement measure. Smyth said he’s spoken to Infrastructure Minister Ron Schuler about the possibility of expanding the locations where mobile photo radar can operate. The lobby group Wise Up Winnipeg would like the province to tighten the reins on the program, rather than expand it. 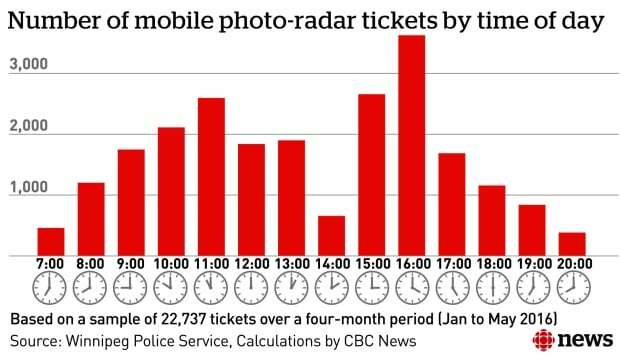 Wise Up founder Todd Dube claims the police have never demonstrated photo radar improves safety on Winnipeg’s roads and claims the mobile program was designed to maximize revenue. 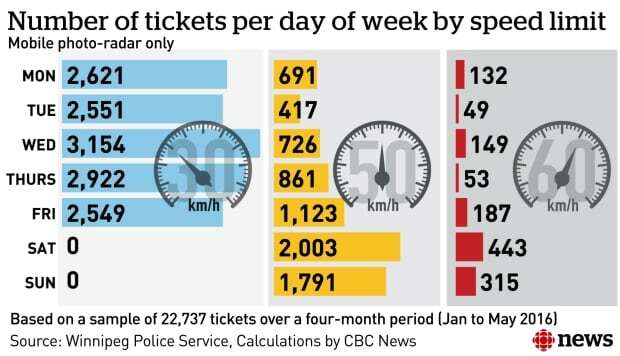 ​The large number of tickets handed out in 30 km/h zones is a perfect example, he said. “It’s unnaturally slow and prudent drivers find themselves exceeding that unnatural speed limit, especially in the city of Winnipeg, because unlike other cities, we don’t even have the accompanying yellow flashing lights you find in other [cities’] school zones,” Dube said Thursday in a telephone interview. Under an agreement between the city and the province, the police are required to submit an annual report on the program’s activities. 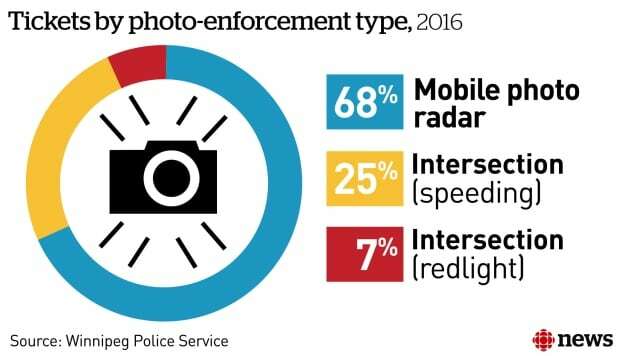 This includes a controlled study evaluating how photo enforcement modifies speeding behaviour and an analysis of the effect of photo enforcement on safety over time. However, none of the annual reports submitted by the police contain this required information. Winnipeg Mayor Brian Bowman rejected the notion mobile photo radar is a cash grab. “It’s the responsibility of all drivers to know what the speed limit is and to obey the law. The best answer if you don’t want to pay for speeding tickets and to slow down,” he said. Dube said politicians always trot out these sorts of lines. In May 2016, CBC News filed a freedom-of-information request for four-months worth of mobile-enforcement data. A month later, the Winnipeg Police Service rejected the request on the basis the records belonged to a third party, mobile-enforcement contractor ACS Public Sector Solutions. In July 2016, CBC News complained to the Manitoba ombudsman, arguing the deal between the police and ACS clearly indicated the city owns the records and can have access to them at any time. With the help of the ombudsman, the police in December 2016 released a disc of information without any mobile-enforcement locations. The police claimed that information would jeopardize the safety of photo radar operators. CBC News complained again and the police released a new disc in October 2017. *Based on tickets issued between January and May 2016.